Minister of Internal Affairs Yuriy Lutsenko, an Orange Revolution 'field commander', giving vice PM Andriy Kluyev, one of the chief 2004 Presidential election steal organizers, a friendly peck. At 5 am this morning over 90 raiders were detained by 'Berkut' special units as they tried to take over the 'Ozyorka' market in Dnipropetrovsk. Melodramatic newsreel footage can be seen here. The minister of internal affairs Yuri Lutsenko called the assault on the market a turf war between Ihor Kolomoyskiy, one of Ukraine's richest men and the 'colorful' Russian 'businessman' Maxim [a.k.a. Mad Max] Kurochkin. "Kurochkin attacks - the 'Privat' group protects itself," said Lutsenko, describing events during which police also detained Oleg Netrebko, who had been a VR election candidate on the Vitrenko bloc list (#21), but now is an assistant to a deputy from the PoR. Kurochkin, a vice-president of the Russian Club in Kyiv, has apparently been in hiding in Moscow after Ukraine's Prosecutor-General launched charges against him. The Russian Club had been created in summer 2004 as a lobbying center for Russian interests and Russian "political technologists" working for Viktor Yanukovych's campaign. The Russian Club was officially opened by the Russian Embassador Chernomyrdin, Yanukovych, Medvechuk, and other 'usual suspects'. Kurochkin is accused of having links to heavyweight organized crime and even survived a mafia-style hit in Kyiv in November 2004. His wife ran the beauty salon in Kyiv' s finest hotel, the 'Premier Palace', which had also been the Russian Club's headquarters. The huge Ozerka market had been 'bought' by Kurochkin in a rushed 'privatization' in October 2004, but after legal proceedings were instigated in Febrary 2005, the privatization was reversed. "Yuriy Anatoliyovych [Boyko], tell us please: 'RosUkrEnerho' - is it a private company?" -"I don't have a clue." "Is it private or state [company]?" -"To me it makes absolutely no difference whose company it is." "But you have you fully given up Ukraine to 'RosUkrEnerho'. Do you at least know.."
-"No, for me this is not of principal importance. For me two matters are pricipally important: The contract should be for 55 Billion [cu.m. p.a.] and the price should be $130." Tymoshenko then produces what she claimed was RUE's company registration document in which the founders submit their start-up funds, as well as minutes of RUE's co-ordination committee, signed by representatives of two companies - 'Tsentrohaz' and the Russian "Erosgaz". One of the 'Tsentrohaz' signatories was Yuriy Boyko, who was head of the Ukrainian State Gas Company 'Naftohaz Ukrainy' at that time. "And when you say you don't know what 'RosUkrEnergo' is, I'll tell you - it's a private company, which was created by state official Yuriy Boyko. And in all civilized normal countries, when a person holding an official state position creates a private company for state circulation [of funds], this is known as corruption. I want every person today who receives a new bill for utilities to know, that they are giving their money not to 'Naftohaz Ukrainy', not to 'RosUkrEnerho', and not even to 'Gazprom', but their money is going into the pockets of the highest state officials." "And when people pay this money I want those people to recall the names of Boyko, Kuchma, Yanukovych and the founders of this [scheme]. And Yekhanurov as the person who perfected the scheme." RosUkrEnergo is the intermediary monopolist supplier of natural gas to the Ukrainian market. Rumblings of discontent amongst Ukrainians, sparked off by massive increases in housing, utility and communal service charges seem to be getting louder. Whether they 'blow themselves out' or continue to grow, and what the political repercussions are if they do, is anyone's guess. Luganskites called on to pay for public services at old tariff rates only and participate in a "communal self-defence" campaign. Today at a meeting of the Lugansk press-club, representatives of public organizations called upon Luganskites to participate in a communal self-defence campaign. The initiators proposed that people pay for public services at the old tariff rates until the authorities finds a way of overcoming the crisis in the housing and communal services complex. Co-ordinators of the action include the 'Civil Forum of Ukraine', 'Lugansk coalition of Citizens for the transparency of the actions of the authorities', 'the Committee for Constitutional rights and freedoms of Citizens', and 'Citizen's control'. According to the head of the Committee for the protection of constitutional rights and freedoms of citizens Nikolai Kozyrev, today the majority of population find themselves on the fringes of destitution - to provide nourishment for one person per month a minimum of 750 Hvn. [about $125] is necessary. "To place the solution of all problems in the housing and communal services complex on the shoulders of people by increasing tariffs is simply inhuman. The population should not pay for the inactivity of authorities and the thriftlessness of kommunal'shchikov." The Chairman of "Citizen's control", Victor Vakumenko said that on 9th December, the initiators of the action intend to conduct a hearing on questions of municipal reform with the participation of people's deputies. Action will be extended to an oblast, and an all-Ukraine level. The initiators of the action declare, that while there is no agreement with the 'kommunal'shchiki', the populus has the legal right to pay 'kommun-uslugi' at the old valuations. They see this as the only way they can force the authorities to earnestly examine the entire municipal service system. According to an opinion poll carried out by "R&B Group" from 16th to 23rd October, 62% of the population of Ukraine consider that since the Match 2006 parliamentary election, the country is not going in the right direction. Only 14% held the opposite opinion, 24% couldn't really say. 69% consider that the political situation in Ukraine is unstable, 10% - stable, 21% - found it difficult to answer. Those questioned named the current problems facing the country as: high prices and low quality of public services - 25%, low wages and unpaid wages - 19%, increases in prices, inflation - 19%, low pensions - 18%, poor material standing of people - 18%, and high level of unemployment - 17%. Also mentioned were the low quality of medical services - 7%, high cost and low quality of education - 5%, shortage and high cost of living accomodation - 4%, problems with the health - 3%, high levels of corruption in state authorities - 3%, poor quality of roads - 2%, decline of agriculture - 2%, problems, connected with fuel - 2%. In the opinion of those questioned, the government should concentrate on the following : increasing social payments - 41%, decreasing the level of unemployment - 29%, resolving gas problems within the framework of interrelations with Russia - 27%, and restoring lost ties with Russia - 24%. The percentage of those questioned who consider the government must concentrate on the preparation of the economy of the country for the autumn-winter period - 23%, introduce tighter controls of the economy from the side of the state - 14%, resolve cadre questions - i.e. select a professional government team - 11%, and act to protect individual rights and freedoms - 8%. The respondents considered the government must also act on the following: the entrance of Ukraine in NATO and European Union - 6% , the elevation of the status of the Russian language to that of a second state language - 3%, and lend support and increase agricultural productivity - 1%. The concerns of "Donbass" newspaper readers are revealed by today's lead story entitled: 'Even bread in now gilded'. The piece is about steep increases in the price of bread and includes a chart with bread prices in the main Donetsk oblast towns. Another story on the irtafax describes problems with communal heating systems. The irtafax website also carries a story informing its readers that the large Alchevsk metallurgical combine is halting production because of difficulties with the supply of raw materials. Trade union leaders have written to PM Yanukovych warning that other plants may soon have to shut down too, if prices for raw materials are not reduced. The background to this dispute about which I posted last week can be found here. "Simple commercial trading between the sellers and buyers of iron ore has become a battle. Opposition between the metallurgists and the miners last week reached, probably its highest intensity in the entire history of Ukraine. Among other things, geopolitical rivalry has appeared in the conflict, between domestic and Russian business." More than 500 invalid miners protested in the central square of Pavlograd [a town just to the east of Dnipropetrovsk] against cabinet of ministers' plans to reduce their benefit payments in the 2007 state budget. they reach the age of 60. These benefits have been paid out since 1992; and they range from 1 to 2 thousand hryven depending on disability and length of employment. In total, in the western Donbass today there are 11,000 disabled miners who obtain these benefits. According to the Deputy Chairman of the Union of invalid miners of Ukraine, Nikolai Tkachenko, "People are infuriated by the behavior of the government. The've chopped what we obtained so far. We will have to subsist on beans, there'll be no money for medicines, there'll be no money for food supplements, nor for recuperation", he said. Tkachenko noted that practically all these men suffer from silicosis, bordering on tuberculosis. Therefore it is not only drugs that are necessary, but also dietary supplements. The protesters have directed a resolution to the supreme rada, to the cabinet of ministers, and also to the President of the Ukraine Victor Yushchenko. According to the miners, they have most hope for the support of the president - they are convinced he will not sign a budget with reduced social payments." In eastern Ukraine some people are beginning to get annoyed because the PoR-led government is not delivering on their March 2006 VR election slogan: "An improvement in your lives, now today." There are massive utility and communal charge increases on the way too..It is up to the opposition parties to pick up the banner and speak up for these people, but NSNU in particular are more interested in their own internal political squabbling. According to the 'Declaration of State Sovereignty' dated 16th July, 1990, Ukraine proclaimed its intention to be a neutral state that will not participate in any military bloc. Of the respondents who want Ukraine to remain a neutral state, 28% justified their position saying such a status was advantageous to our country, 23% said that the neutrality of Ukraine was the essence of its independence, 22% concluded that this status gives Ukraine fewer problems, while 9% thought this the optimum position for interrelations with other countries. The Ukrainian SSR has the right to its own armed forces. The Ukrainian SSR has its own internal armies and bodies of state security subordinated to the Verkhovna Rada of the Ukrainian SSR. The Ukrainian SSR determines procedures for military service by citizens of the Republic. Citizens of the Ukrainian SSR perform their military service, as a rule, on the territory of the Republic, and cannot be used for military purpose beyond its borders without the consent of the Verkhovna Rada of the Ukrainian SSR. The Ukrainian SSR solemnly declares its intention of becoming a permanently neutral state that does not participate in military blocs and adheres to three nuclear free principles: to accept, to produce and to purchase no nuclear weapons. I presume a national referendum would be required to alter this Declaration, before entry into NATO could be considered. "We will continue to hold meetings until the draconic tariffs are changed! Yesterday near the building of the Konstantinovka town council approximately two hundred angry townspeople with placards in their hands emotionally protested against the sharp increases in the cost of living. The reason for the picketting of the town council was the decision of local deputies to introduce new, two-fold increases in tariffs on housing services and utilities in the city. Last Friday, at a special session, elected representatives almost unanimously abolished the previous tariffs affirmed by city council in the past year. It is possible to understand the position of authorities - in the event of their non-acceptance of new tariffs, the city will not receive 1,5 mln. hryven from the state budget in the form of subsidies for fuel. One way or another, from 1st November the monthly payment of the heating of one square meter of dwelling in Konstantinovka rises to 2,64 hryven, and for the delivery of one cube of water, to 2,22 hn. Meetings will be held repeatedly, until the excessive valuations are completely cancelled." But what is interesting is that day's edition of "Donbass" also carried a large article by Yuliya Tymoshenko entitled "About populism, tariffs and the [VR] speaker/terrorist", which had been posted in various other periodicals including her own website on 5th October. In it she lambasts PoR and the Socialists for voting down a motion in the VR to maintain a moratorium on price hikes on these tariffs, after having supported it weeks before. Last Thursday the NSNU executive council head Mykola Katerynchuk declared that the leader of a united VR opposition should be Yuliya T.
At Saturday's NSNU congress fiasco, once Yushchenko had finished his address, Roman Bezmertnyi's immediately pronounced that the congress was ending but would be reconvened in three week's time. The abrupt termination of the congress was met by the chanting of Katerynchuk's name by some of the delegates who wanted it to continue. All of the delegates had received a 'welcome pack' containing congress documentation etc. - the pack also included a copy of a book entitled, 'The Donetsk Mafia'. 'Oboz' periodical journalists made enquiries whose idea this was; no-one was keen to say, but apparently it may have been Katerynchuk's. None of the party's leading lights were to be seen holding or examining the book, probably because of the numbers of TV cameras present. NSNU in the anti-crisis coalition still possible? Today in Kyiv, at the 3rd Congress of NSNU, President Yushchenko confirmed that he remains the honorary chairman of party. He declared that the party is in a state of 'serious internal crisis', and that the party leadership is responsible for this state of affairs. He severely criticized the fact that reconstruction of party is being conducted by 'administrative methods', where party cells and members of the party are selected by leaders at the top; and was dismayed that, "By recruiting members of the party from the representatives of authority - the party has become an appendage of the power structures". "I do not want the party to become the closed joint-stock company, where the main shareholders decide, what it is necessary for party, but in reality decide their own, or near to their own interests", said Yushchenko. "The party and its leading organs, and especially presidium must be held responsible for this," he added. He is still sticking with the idea of a grand coalition. "If you attentively listened, my position is political consolidation with different forces, including with PoR, SPU, and parliamentary and extra-parliamentary forces," said the President. The negotiations [on coalition building], in his opinion have not yet ended. The head of the party council, Roman Bezsmertnyi, together with the party leadership have now [sort of] relinquished their authority, and it was agreed that the Congress reconvene in 3 weeks time. Bezsmertyi remains 'acting chairman' of the party council. Other party leaders, in particular Petro Poroshenko considered that the President's criticisms meant that the entire party leadership should go too. In short - a complete shambles. Are this bunch fit to govern the country? and Ukraine has to agree to use the monopolist intermediary gas trading company, RosUkrEnergo for the next five years for its gas purchases. However, this would only postpone hikes in the price of gas for one year. Yanukovych has already stated that, "The price of the gas for the Ukraine will be $200-210 per thousand of cubic meters in the following (2008 -7) year." Another article in the same newspaper describes conflicts between some of Ukraine's biggest industrial corporations and their suppliers of raw materials. On Wednesday about 300 workers from the Alchevsk Metallurgical Kombinat (AMK) which is controlled by "Industrial Union of Donbass" (IUD), blocked the work of the Makeyevka Metallurgical Plant (MMZ), which is part of Vadim Novinskiy's "Smart- group". The management and workers of AMK were reacting to an increase in the prices of iron-ore raw material supplied by the ['Smart-group'-controlled] Ingulets GOK [ore enrichment plant] which is actually situated much further away, near Kryviy Rih. Experts consider that similar conflicts could be repeated with other participants in the market. The annual turnover of IUD is about $3,5 billion - its joint owners are Sergey Taruta and Vitaliy Hayduk, who President Yushchenko recently appointed secretary of the National Security and Defense Council. MMZ published a press release, reporting that on 18th October approximately 300 AMK workers from Lugansk travelled to the Donetsk region to block the work of the MMZ enterprise. Two of five railway lines were partially blocked by some of the men, disrupting railroad freight traffic to MMZ. Another group of workers from AMK, headed by the chairman of trade-union committee Boris Shevel'gin, arrived at MMZ's administration offices, which they picketed. Their actions were precipitated by Inguletsk GOK's sudden steep price increases for iron-ore raw material from November 2006. The tangled web of ownership of enterprises that form 'Smart-Group' is partially revealed in this informative website. More on similar struggles here and here. The NSNU bloc are staging a special congress this Saturday, but there is no indication that they have 'got their act together'. 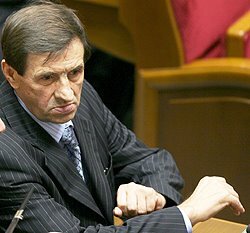 Today Roman Bezsmertnyi said there is a possibility congress could deny support to its leaders' recently declared opposition status for the party, (in which case he would resign); whereas Ihor Zdanov, deputy head of NSNU's central executive committee, stated in an interview that: "Discussions with the [PoR-led] anti-crisis coalition are today unrealistic." Zdanov did not rule out the possibility that Yushchenko could give up his position as Honorary head of the bloc, saying that if he did, "..our attitude will be one of understanding to his choice. But personally for me, and for many party members, Viktor Yushchenko will, in any event, remain our leader. " The impression being given is that NSNU are split and disorientated. What is slightly odd to a western observer like me is how little gloating and ridicule there has been from Yanukovych and PoR boys over NSNU's predicament. They feel there is still a possibility that some NSNU deputies may switch over to their anti-crisis coalition, making them less dependent on their Socialist and Communist anti-crisis coalition partners, so maybe don't want to 'put the boot in' too hard just yet. Things could become clearer after Saturday, but NSNU's recent track record on making clear-cut decisions is not encouraging. The 'oranges' are miles away from looking anything like a creditable alternative to the current government - something 'an opposition' should strive to be. So the saga is over - yesterday NSNU faction leader Roman Bezsmertniy formally announced that his party is going into opposition in the VR. From yesterday, then, Ukraine has two opposition groups: BYuT who formally announced their opposition status several weeks ago, and now NSNU. Many experts doubt whether NSNU will get together with BYuT in a co-ordinated manner in the VR - the problem being 'that woman' Yuliya T. The two parties will continue to fight for the support of the orange electorate. Because there has to be some kind of 'modus vivendi' established between the anti-crisis coalition and Cabinet of Ministers on one side, and President Yushchenko on the other, it is thought that NSNU could adopt a kind of 'semi-detached' opposition status. But the stark reality now dawning on NSNU deputies is that there may not be much of a political future for NSNU at all. The President, with his recent appointments, has put some 'clear blue water' between his administration and NSNU. Viktor Baloha, the new head of the President's administration declared that Yuschchenko may be stepping down as NSNU's honorary leader. This may even be decided at an NSNU 'pow-wow' this Saturday.. If the Pres does does step down, it will be huge blow to the party and could provoke a major crisis amongst its ranks, so some other kind of link with the President will have to be formed and maintained. Update: Interesting interview in 'Bez Tsenzury' today with deputy head of NSNU 'ispolkom' Ihor Zhdanov entitled,' The president will not turn away from his 'child'. When asked about whether the pres intends to set up an alternative political project, he replies, "As a father of two children, [I can tell you] in order to give birth to a second child, you don't have to reject the first." There are pointers there too on how NSNU envisage their future activities. "First deputy Prime minister and Finance Minister Mykola Azarov has been looking after his pals again. Exporting manufacturers from Donetsk [and Lugansk] have received a far greater share of Value Added Tax reimbursements for the month of August, than similar exporting manufacturers from other regions of Ukraine." VAT 'fiddles' are apparently a speciality of Azarov's. Yuschenko announced: "I am directing the Security Service of Ukraine to start active work ... on documenting facts of corrupt actions by employees of government agencies, the State Tax Administration, the State Treasury, and the customs on the issue of refund of VAT." He demanded that the SBU's Chairman Ihor Drizhchanyi prepare a report on this issue within 30 days and submit it at the next meeting with Yushchenko on the issue of VAT. ..Yuschenko directed the new-appointed National Security and Defense Council Secretary Vitalii Haiduk on October 17 to prepare for a meeting of the council, at which the legality of refund of value-added tax will be discussed. Hayduk is up and running..We will see in time how effective he will be in sorting such matters out. Update : More on this story in English here. Yesterday I posted a translation about troubles in the Donbas region between some of Ukraine's largest and most powerful industrial corporations - Rinat Akhmetov's SCM, and the Mariupol Metallurgical Combine im. Ilyich run by Volodymyr Boyko, (see photo) who is one of Ukraine's richest men and a Socialist VR deputy. He may well be their financial sponsor. Akhmetov is PoR's financial 'sugar daddy'. PoR and the Socialists, together with the Communists form the ruling coalition in Ukraine's parliament. An economic war has flared up between some of Ukraine's largest metallurgical groups. At the end of last week the director of the Mariupol Metallurgical Combine im. Ilyich [MMK] Volodymyr Boyko openly accused the "largest financial- industrial groups" of unjustified price increases in raw material - he was talking of structures, controlled by Rinat Akhmetov and Vadim Novinskiy. In the opinion of experts, the cause for this war is bitter rivalry in a privatisation competition for two industrial enterprises: "Komsomol mine management", and Krivoy Rog GOK [ore enrichment plant]. "It is obvious that the entire metallurgical market is set against Volodymyr Boyko today. There are several reasons for this. First of all Mr. Boyko is behaving aggressively and, instead of negotiating with the partners, he blames them," said the director of the union of blast-furnace workers Vladimir Tereshchenko. "He has crossed the path of the Russian 'Metalloinvest ' and 'Smart- Group ', insisting that the Krivoy Rog GOK should be his, and not shared in a joint venture. But he has also annoyed the entire market by fact that he attained preferential conditions for the privatization of "Komsomol mine management" from State Property Fund," added Tereshchenko. Although the Donbas region voted overwhelmingly in support of Yanukovych and PoR in the last two elections, there are tensions between rival industrial corporations and their industrial baron owners and chairmen which, if they continue to grow, could possibly even affect the balance of power in Kyiv. "Il'ichite" Volodymyr Boyko hints, that "lyubi druzi" in the "anti-crisis coalition" can destroy the Mariupol Metallurgical Kombinat im. Ilyich (MMK) as well as a bunch of sponsored kolkhozes 'im. Lenin'. The President of the (MMK) im. Ilyich (Donets region), VR deputy Vladimir Boyko declared, that the situation in the mining and metallurgical complex threatens the existence of the number of metallurgical enterprises, according to reports today in "Interfax-Ukraine". Vladimir Semenovich Boyko's recent history is a tale of moral-political twists and turns worthy of dramatic novel- it reveals the consequences of following the orders of "Yanuchary", given out by them on the eve of the 2006 VR elections. After V. Boyko led his multi-thousand 'kolektiv' to the elections under Moroz's banner; after they went over to the "yanuchary", when Moroz himself (who without the support of "Il'ichevskiy" proletariat may not have made it into the VR, but would have joined the other socialists - ie the "progressives" and "uniteds" - out of power) grabbed the VR speaker's chair, the "red director [Boyko]" was covered with gloom. None of the "Donetskiye" have forgotten Vladimir Semenovich's successful attempt to prevent them in 2000, taking control of "MMK im. Ilyich" which did not fall within the standard procedure of privatization, but remained the property of a so-called "workers' collective". No-one has forgotten of how he publicly declared that the Donetsk "gang" (that's how Vladimir Semenovich characterized the Donetsk Oblast State Admin when Yanukovich was its governor) wanted to take away and steal for themselves this metallurgical giant, and even made an attempt on the life of "Il'ichevsk" leader [Boyko] himself. Crucially, after 'Krivorozhstal' slipped out of Akhmetov's hands [when reprivatized], real power was won by him in the VR elections, and the Mariupol'skiy Metallurgical Combine has now become not only desired, but also easily attainable. Indeed in spite of being regarded as more 'a man of the people' that any of the other 'steel barons', Boyko's behaviour has been curious in the last few months. For example, he called his people to vote in the 2006 elections for Moroz - but his people voted for "Regionaly". This caused Vladimir Semenovich grevious offence, and he reduced investment for the improvement of local schools, hospitals and tramways [as punishment]. He encouraged local media to pick a fight with the Mariupol town council, dominated by "Yanuchary". But then after entry of the Socialists into the "Anti-crisis coalition" Vladimir Semenovich replaced his righteous anger to Yanukovych and Co. with sweet statements via his journals and media. But the "Donetskiye " are not to be so easily assuaged. And yesterday in Dnepropetrovsk the "Il'ichtites" started whining that their hopes for benevolence from "Donetsk gang" have not been realized in any way. Quote from " Interfax-Ukraine": "How will we be able to survive with those conditions, which have now been created with gas? We can survive everything, if we build correct interrelations inside the state, " said V. Boyko on Thursday in Dnipropetrovsk at a conference on the development of the Mining/Metallurgy Complex, which Viktor Yanukovych also attended. He noted that his Kombinat acquires gas at 108 dollars for 1 thousand cu. m, and taking into account transport expenditures and VAT, its price is $148 for 1 thousand cu. m. V. Boyko also emphasized that the ore-enriching combines (GOKs) sell concentrate to MMK im. Ilyich for 260 hr. per 1 ton, whereas its cost comprises just 137 hn. V. Boyko added that the GOKs are intending to increase price even more. "All of the resources in the country in actual fact now belong to just a few groups, and it is necessary to solve the question of their relation with other participants in the market," said the VR deputy. The honorary President of the MMC [Boyko] noted that in Ukraine, "actually four plants have found themselves without raw materials, amongst them are - MMK im. Ilyich, and 'Zaporizhstal'." V. Boyko emphasized that Inguletskiy GOK, since the beginning of the year, increased its price on raw material from $27 to $50.5 per ton for simple concentrate, and also to 58 dollars for a ton for 8% concentrate." What is more remarkable, is that "brave and uncompromising" Vladimir Semenovich was a model of diplomacy and did not confront Yanukovych with the names of those GOKs, which have passed into the hands of Rinat Akhmetov- his partner in the anticrisis coalition. These are SevGOK nor TsGOK. The 'Ostrov' website recently posted this article [In English]: "At the most successful mines of mining administrations of ‘Donbass’ and ‘Yuzhnodonbasskaya’ No.1 strikes are being prepared". I have also written on this subject, and on tensions between two of Ukraine's biggest industrial corporations, Akhmetov's SCM, and IUD, just a few days ago. President Yushchenko, with his recent appointments and reshuffles has brought into his presidential administration and into the National Security and Defence Council (which he chairs), persons associated with one of the largest Ukrainian Financial and Industrial Groupings, 'Industrial Union of Donbas' [IUD]. He has done this, according to most analysts, to counteract the influence of the largest Ukrainian FIG, Rinat Akhmetov's System Capital Management [SCM] which dominates Ukraine's largest political party - Party of Regions. Newly-appointed NSDC secretary Vitaliy Hayduk, and Serhiy Taruta between them own almost all of IUD shares. Not so many years ago Akhmetov, Taruta, Hayduk, and Yanukovych co-operated together in a scheme by means of which they amassed their initial wealth. In simple terms, the steelmaking factories of Akhmetov received coke at ridiculously low prices, settling their debts with mines and coke producers by means of barter or by laughably low cash payments. The coke-producing enterprises which supplied them became hopelessly uneconomic, but with the connivance and lobbying of the Oblast administration, led by Yanukovych and Hayduk, they received subsidies from the national budget [again with strings attached in the form of political support]. In just a few years IUD gained control of the industrial plants of Eastern Ukraine which were being sold off by the Ukrainian State Property Fund. In 2002, Akhmetov decided to 'cash in' and take out what was reputedly a 25% stake in IUD. He received Azovstal, and the Khartsizk pipemaking plant as well as other assets which formed the core of SCM. No-one knows for sure if, or how closely, SCM and IUD will co-operate again in the future, but some observers envisage Ukraine developing along the same lines as South Korea, whose economic and political spheres are dominated by just a small number of FIGs. The separation of business and political power, of which there was much talk when the orange government of Tymoshenko was appointed, seems a long way in the past. "Large business cannot actually work in the opposition, this is simply unnatural. The logic of the deputies mentioned by you [BYuT deputies who voted against their block to resist a moratorium on utility pricing] was obvious even without the link to their entreprenurial activity." Breaking up is so hard to do..
"Nobody knows for sure, whether 'Nasha Ukraina' will finally approve a decision to go into opposition. While Roman Bezsmertnyi says that all bridges [between NU and the PoR-led coalition] are burnt, half of the [NU] fraction stand ready with fire-extinguishers to put out the fires." NU's Ministers seem confused too. Youth and Sports Minister Yuriy Pavlenko, appointed as part of NU's quota, claims that he has not submitted a resignation directly to the Verkhovna Rada, but rather to the NU fraction leader, Bezsmertnyi. Pavlenko says that the ministers from Our Ukraine are going to quit just after the completion of the coalition talks, and that all the ministers, including the President’s quota – the Foreign, Defense and Interior Ministers, were ready to resign. Health Minister Yuriy Polyachenko confirmed that resignations had been submitted by the NU ministers. Yet Culture Minister Ihor Lihovyi revealed to Ukrayinska Pravda that he had not handed in his resignation. pps More disreputable names from the past are being 'pulled out of their coffins'. Obkom reports that Serhiy Levochkin, one of Kuchma's closest aides, has been appointed head of of the PM's 'Apparat' which is to replace the PM's 'Service'. 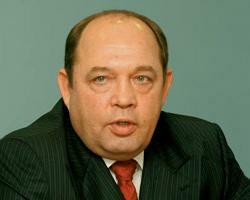 Hayduk's career took off in the mid-'90s, when he was made Deputy Chairman of Donetsk oblast rada. Subsequently he was appointed first deputy of the Donetsk oblast state administration, for a time serving under Victor Yanukovich's chairmanship. From October 1997 until February 2000 Hayduk was President of the closed joint-stock company "Vizavi". From November 2002 to December 2003 he was vice-PM of Ukraine responsible for the PEK [fuel and energy complex]. Together with Sergiy Taruta and Rinat Ahmetov, he created the 'Industrial Union of Donbass'. When Akhmetov lost interest in ISD and switched from gas to metallurgy, it was Hayduk that kept the corporation afloat. Hayduk is also the President of "Industrial Group" (Kiev) consortium , and chairman of supervisory council of "Dzerzhinskiy Dniprovsk Metallurgical Combine". As energy vice- premier, Hayduk spoke against the creation of a gas transport consortium with the participation of Russia, and was against the reversing the direction of flow of "Odessa- Brody" oil pipeline, favoring rather its extension to Poland. He is considered to be a solidly pro-Ukrainian politician, despite being a 'Donetskyi'. The union of two structures, those of Rinat Akhmetov and of Vitaliy Hayduk, formed what was loosely called 'the Donetsk clan', but despite this, if there was one person responsible for introducing 'new [more civilized] rules of the game' in the economics of the region, it was Hayduk. A serious 'politolog' considers Hayduk's appointment, and recent staff reshuffles in the Pres's secretariat, indicate that Yushchenko is undertaking a new political project. Now that PoR have taken a grip on state political initiatives, the President does not have a center of power capable of providing resistance. Neither NSNU, nor the President's secretariat, nor the NSDC can do this effectively. The solution is to create this new center based of the new secretariat of the President, filled with new personnel. The secretariat will compete with the government (incidently, exceeding its legislative and constitutional scope). Unofficial financial support for the project will be provided by ISD. The new project will not only try to recapture support from Tymoshenko's BYuT, which is now supported by most of the 'orange' electorate, but also try to garner support elsewhere amongst the 'non orange' electorate. Yushchenko is hoping that the new personnel will help him regain some popularity amongst the populus. Today President Yushchenko has appointed Oleksandr Zinchenko as an adviser, according to the President's press-service. By coincidence I mentioned him in my previous blog a couple of days ago. He had run Yushchenko's 2004 presidential campaign, replacing Roman Bezsmertnyi, now one of NSNU's leading lights who wasn't up to the job. Yushchenko appointed Zinchenko Presidential chief of staff immediately after his inauguration, but Zinchenko resigned several months later alleging corruption amongst the President's closest advisers. His resignation resulted in Yushchenko sacking the then PM Yuliya Tymoshenko, the subsequent break-up of the orange camp, and arguably the resurgence and victory of a PoR-led coalition in the March 2006 VR elections. Zinchenko's 'rehabilitation' would seem to indicate that Yushchenko now accepts Zinchenko's assertions on corruption in the president's inner coterie were true, even though a court forced him to refute them. Some observers speculate that Zinchenko's re-employment by Yushchenko may show that speculation over Tymoshenko's possible appointment to the position of Secretary of the National Security and Defense Council may have some grounding. The wily Zinchenko lead 'Party of patriotic forces of Ukraine' in the March 2006 VR elections. But they 'bombed' badly. There were rumors that he had 'fell out' with Yuliya T and BYuT, so set up his own party. Is this more evidence that Yush may be distancing himself from NSNU? And Vasyl Baziv, about whom I posted yesterday when he surprisingly got a new job in the President's Admin, has been fired today - what's going on here? The U-turns and somersaults performed in Ukrainian politics in the last few years by politicians are truly astonishing. Same old faces keep turning up.. The head of President Yushchenko's secretariat, Viktor Baloha, today confirmed that Vasyl Baziv has been appointed his adviser on information questions. When asked whether he was disturbed by the fact that Baziv was once considered the "voice of [disgraced former President] Kuchma," he answered: "If a man has a contemporary outlook, and can give useful advice, I consider that these people should work [for us]". In 2003-2004 Vasyl Baziv held the post of the Deputy Head of the President Kuchma's Administration - leader of the main analytical service of the administration, and Kuchma's main speechwriter. During the 2004 Presidential elections, after Yushchenko was poisoned, state-run and oligarchic media began to issue sarcastic reports suggesting that Yushchenko suffered from poisoning from some exotic food or just alcohol. "I would recommend checking food before consumption in order to avoid stomach problems," Vasyl Baziv, deputy head of the Ukrainian presidential administration, told journalists on 17 September, thus establishing the tone of official comments on Yushchenko's condition. "Let Zinchenko taste the food first, before Yushchenko begins to eat it.... That's what rulers did in the Middle Ages," Baziv added. Oleksandr Zinchenko, who did a good job heading Yushchenko's election campaign in 2004, was rewarded by being appointed the president's chief of staff but later resigned, alleging corruption amongst the President's closest allies. The rehabilitated Baziv is back. Same old faces keep coming around on the Ukrainian political merry-go-round.. The Supreme Rada of Ukraine [VR] voted to annul the moratorium on price increases on gas and public services for its citizens. The motion was supported by 249 deputies, including 184 from PoR, 7 from BYuT, 3 from NU, 30 Socialists, and 21 Communists. Apparently, when the VR introduced the moratorium it strayed beyond the framework of constitution. Yulia Tymoshenko stated that the cancellation of the moratorium will lead to the crisis because of municipal non payments. Her companion-Oleksandr Turchinov said, "SPU and KPU have betrayed its voters". The Yanuk gov is 'endearing' itself to its electorate in other ways too. A change of government in the country, and accession to power of new political forces has given rise to a 'clear-out' in the mines of Donbass. Mine bosses who showed loyalty to the orange authorities, are the first on the list of those deemed 'objectionable'. MinUgleProm [Ministry of the Coal Industry] has justified the change of leaders by the need for a more qualitative and more professional approach to the work of enterprises. "Let's take, for example, the directors of mine 'Yuzhnodonbasskaya #1' Mikhail Bugar, and administrator of "Donbass" [mine] Yuriy Baranov. These enterprises are foremost in the region. However, they, as well as a number of other influential mining bosses, did not support PoR in the past parliamentary elections. Mikhail Ivanovich, as the deputy of Donetsk provincial council, even headed the NSNU fraction. This is just settling of scores by political opponents on the part of Regionaly, and by MinUgleProm head, Sergey Tulub and his party leadership. As a result , the entire branch will suffer, as will tens of thousands of miners and their families. The best personnel are being kicked out, just as in 1937, in Stalinist fashion - similar 'chystki'are well known in our history. Some of the mine bosses are being removed in order to clear places for the numerous relatives of persons in PoR, " said the leader of the Independent trade union of Donbass miners Nikolai Volynko. Actually, it looks as if an intensive preparation for the privatization of enterprises by concrete financial- industrial groups is taking place. First it is necessary to drive them into bankruptcy in order to reduce costs. However, the present management is actively preventing this. In Donetsk there is talk that the above-mentioned Yuri Baranov and Tulub have personal scores to settle. Miners consider that Tulub is taking revenge on Baranov for sacking his nephew from the post of the deputy chief of the mine. The methods used by the ministry to find reasons for displacing the directors, are hardly original. First the mine administration of "Donbass" unexpectedly received an unexpected 'visit' from all possible controlling bodies. Several days of inspections were conducted by numerous commissions from the Attorney General's Office, but these were to no avail. Then, in order to cause the dissatisfaction of workers with the management of the enterprises, MinUgleProm refused to return 35 million hryven to the mine administration - this was technical credit for the renewal of coal extraction work on "Kommunar" #22. In the "SverdlovAntratsit" works the matter reached complete absurdity. To dismiss its director, Yevgeny Gorovog from his job, ministerial officials with SpetzNaz [Special Force] troops entered into his office, read out an injunction, and evicted him through the door. Such methods cause serious dissatisfaction amongs the workers. In some enterprises the situation is on the verge of mutiny. Even the local trade unions, who were never especially loyal to the mine authorities, have sprung to the defense of the mine bosses. Valery Bogatishchev, the chairman of the independent trade union of the miners at the "Donbass" enterprise, said their six-thousand plus worker collective feels a direct threat to their future, with the change of its leadership. "People are not against conducting cadre policy in the branch, but, it must be carried out reasonably, in the interests of the state and working collectives. In this case, this is completely be absent. Baranov is unique in his field. While [mining] in the last 20 years has gone down, he put it together grain by grain," explained Bogatishchev. …As early as 1981 Yuri Baranov insisted that his foremost mine named after the newspaper "Socialist Donbass," joined up with the "Zapereval'" mine, which was lagging behind according to all indices. For this he was nearly deprived of party membership card. Three years another 'outsider' [failing] mine, "Glybokaya" was also added to the group. In 2001 he insisted that the "Pochenkova", now "Shcheglovskaya-Glybokaya" which was due for liquidation, be added to his mining group too. Today this leading coal-mining enterprise, produces over 3000 tons of coal every day. According to all calculations, by 2009 the mines will be producing over million tons of coal p.a. To call Baranov a poor manager is difficult, and titles such as 'Hero of Socialist Labor' and 'Hero of Ukraine' are not lightly given out. Baranov has been asked to write his own [resignation] statement. Even if he does this, his workers may not allow him to go. There is a similar situation in the Donetsk satellite town of Ugledar which is a one-company town dominated by the "Bugary" enterprise. The entire town is ready to defend its boss. But most of all today, what most angers miners, is the complete lack any systematic approach by MinUgleProm in the reorganization of mining. The independent trade union of the Donbass miners has already handed an open letter to Yushchenko. The letter states: "That which is taking place in MinUgleProm, cannot be called anything but a sequential attempt to destroy the mining industry in Ukraine. And, if we undertake no measures this time, the process of destruction will be final and irrevocable. Ukraine can maintain its status as an energetically independent power, only by preserving a nationalized coal industry. " What have the Communists to say about all of this? As for the President, he says, "I do not consider the discussion process [on coalition-forming] to be exhausted. I direct each political force to think over yet again its position and conclude the round table with the signing of a suitable agreement." Is he on the same wavelength as NSNU? Or PoR? NSNU are probably reluctant to join a coalition with PoR, when PoR are letting down their electorate so soon after the elections. PS more on possible strikes in Donbass from 'Donbass' newspaper here. "[Kyiv City] Deputies gift judges 11 hectares of land"
City authorities continue to give out plots of land. This time it was the workers of the Supreme Court of Ukraine who 'got lucky' when they were awarded 11 ha of the "Troyeshchina" recreational park for the building of private cottages. This unprecedented decision was made last week by the KyivRada. It seems that Leonid Chernovetskiy's [Mayor of Kyiv] team decided to repeat the controversies of its predecessors who tried to give away dozens of hectares of the "Pushcha Vodytsya" nature reserve to distinguished politicians and businessmen for them to build dachas and gardens. This time the Kyiv Rada made the decision to award the workers of the Supreme Court of Ukraine the 11 ha plot on a 'free of charge' lease for to five years, via the Society of the housebuilders "Desenka" (whose members the judges are). Permission has been granted for the building of 80 individual cottages and social-welfare units. In accordance with the resolution of the city council, the judge's dachas will be scattered in the green belt zone between the village of Troyeshchina and the Desenka river. The conversion of part of the urban park, from was was formally "green zone" into a "territory of farmstead- housing building", was taken without the agreement of the appropriate KyivRada commission. The KyivRada Secretary Oles Dovgiy (Leonid Chernovetskiy block) suppressed all attempts to debate this question (even though city ecologists tried to protest against this decision). The voting in the Kyivrada for approval of transfer of land to the Supreme Court workers was as follows: 74 of more than 80 registered deputies supported the motion; 20 out of 40 BYuTivtsi voted for, 19 of the 21 deputies of the fraction of the Leonid Chernovetskiy Bloc voted for; 7 of the 15 NU guys voted for; and all 9 PoR voted for. Members of ecological commission have asked Leonid Chernovetskiy, as head of the KyivRada to initiate cancellation of the decision." An explanation of why Alfa-Group are so keen to control Kyivstar and squeeze out Telenor here. Is my posting today in any way connected to yesterday's posting? Last week President Yushchenko met with one of Russia's richest oligarchs, Mikhail Fridman, who's business conglomerate Alfa-Group includes 'Altimo', owners of Ukrainian 'Storm', who in turn own 43.5% of Ukraine’s largest mobile 'phone operator Kyivstar. Kyivstar is one of Ukraine's most successful companies, worth around $6 Bn. Profits last year - about $320m. Officially, they discussed Alfa-Group's possible sponsorship and participation in the "Mystets'kiy Arsenal" project, [one of Yush's pet cultural projects]. Altimo have been in dispute over many months with Norwegian telecommunication company Telenor, owners of the remaining 56.5% of Kyivstar. About two weeks ago Ukraine’s Kharkiv Region Court of Appeals upheld Norwegian Telenor's request that they maintain a priority vote on the board of directors of Kyivstar. Today the Supreme Court of Ukraine revoked a decision of the higher economic court of Ukraine of 27th June 2006, and restored a ruling of 22th December, 2005, enabling shareholders of "Kyivstar" to introduce changes in the regulations of company and to select the new composition of the council of directors. Telenor will lose its priority vote, so are naturally highly pi$$ed about this. Telenor's press service have stated that the Supreme Court of Ukraine's ruling may well harm foreign investments in the Ukraine. "[The ruling] ..casts doubt one of the basic principles of the right of property - the right of a majority shareholder of company to hold the majority of seats on the board of the directors of that company. If the decision remains in the force, it will become alarm signal for many acting and potential investors in the Ukraine, and have a negative effect the business atmosphere of the country, " said executive Vice President, and chief of operations Telenor in Central and East Europe Jan Edvard Tigesen. He also called upon all members of the business community in Ukraine to support and sign an open letter of protest about this matter, to provide better protection to investors in Ukraine, and not to allow such distortions of normal world standards and principles of corporate rights to take place. The President didn't make any 'behind-the-scenes' telephone calls on his mobile after his meeting with Fridman did he? ps On 31st May 2006 the Norwegan Minister of Foreign Affairs, Jonas Gahr Store, addressed a high-powered conference in Ukraine: "Ukraine and the Information Society – the Road Ahead," organized by Telenor and Ericsson, two global leaders in telecom and information technology. Here's a bit of what Jonas Gahr Store said: "Cooperation between Norway and Ukraine is particularly close in the telecom sector. And this is why I have the pleasure to attend this event. Telenor is the largest Norwegian investor in Ukraine and the largest Western European investor in the Ukrainian telecom sector, with a track record dating back to 1997. This is the most successful example of Norwegian-Ukrainian business cooperation ever. The Norwegian government supports the strengthening of such ties. Ukraine’s favourable economic path is due to its impressive technological development. Here as elsewhere, the introduction of new technology is leading to more efficient use of available resources and greater output, resulting in sustainable economic growth. The revolution in information and communication technology around the world is at the core of this technological transformation. In Ukraine the ICT revolution is taking place at a particularly impressive pace. In less than ten years, mobile telephone penetration has gone from zero to more than 70 per cent. Telenor has taken part in and helped shaping this revolution, as co-owner of Kyivstar. Telenor, the largest network operator in Norway, has also been instrumental in transforming my country’s information infrastructure into a world-class system. This goes beyond technology." The head of Ukraine's Presidential Commission for Foreign Investments, Mr. Gaydutskyi, was a guest of honor at this conference. Gaydutskyi was reportedly also present at last week's meeting between Yushchenko and Mikhail Fridman..
More on what this is really all about here and here..
"Edward Chow, an energy consultant who worked with Chevron on Caspian and Chinese projects, and who has done extensive analyses of Russian and Ukrainian energy policy, says that while big western energy companies could develop the Black Sea, their participation has certain disadvantages from the point of view of some Ukrainian politicians. "If major western companies get involved in Ukraine, they will have to open up the black box of their policies, and all sorts of cockroaches will come out. Who gets access to local customers? Who gets what prices for your production? Who gets access to pipelines and how do they get it? Who gets to export?" Yulia Tymoshenko, the former prime minister of Ukraine, and now leader of the opposition, could benefit from internal opposition to the energy dealings. According to Mr Chow: "There is no one other than Tymoshenko to lead on the transparency issue. She is speaking on behalf of good government, of asking why Ukraine needs middlemen and shadowy deals." ..The issue for energy minister Boyko is not what gets done but who does it. If it's going to be done by people he doesn't control, he doesn't want to do it at all." There is good news here for one group: Gazprom investors. At this rate, the Russian gas company will be able to hold on to a nation of customers for decades longer." The article is also posted on Tymoshenko's personal website here. An article a couple of weeks ago on the 'Ukr Pravda' site [in English] came to similar conclusions. The latest 'Dzerkalo Tyzhnya' ['Zerkalo Nedeli'] includes a small piece which illustrates Yanuk's and Klyuyev's nonchalant attitude to the attempted 2004 Presidential election steal. The excellent 'Neeka's Backlog' translates a portion of the article. "The head of Presidential commission for Foreign Investments, Mr. Gaydutskiy was absent from a [recent] sessional meeting of the commision's group which investigates problems encountered in Ukraine by important foreign investors. During the meeting [representatives of] "Telenor", which is engaged in a legal battle with the Russian "Alfa-Group" for the control over the [telecoms] company "Kyivstar", complained about the wilfulness of Ukrainian courts. [Interestingly] At the same time President Viktor Yushchenko was receiving Alfa-Group boss - Mikhail Friedman [one of Russia's richest oligarchs - $10Bn+]; Mr. Gaydutskiy was also present. Media reports said that they discussed Alfa-Group's sponsorship and participation in the "Mystets'kiy Arsenal" project. [one of Yush's pet cultural projects]. " Ukraine’s Kharkiv Region Court of Appeals has given Norwegian telecommunication company Telenor a priority vote on the board of directors of Ukraine’s largest mobile operator Kyivstar, Telenor said in a press release Wednesday. Telenor filed an appeal with the court seeking to overturn a previous court ruling that gave Telenor and Ukraine’s Storm, the two shareholders of Kyivstar, equal voting rights on the board, Cellular-News reported. Telenor holds 56.5 percent in Kyivstar, while Storm, controlled by Russia’s Alfa Group, holds 43.5 percent. In 2005, Storm’s direct owner, Alfa Group’s telecom unit Altimo, filed a lawsuit with the district court seeking to amend Kyivstar’s charter and won the case. Kyivstar’s subscriber base totaled 16.6 million users as of August. I did a bit more Googling - which quickly revealed a mass of entangled financial shenanigans involving many of the 'usual suspects' - Kuchma, Lazarenko. etc. around what everyone knew would be a big moneyspinner - Kyivstar. Check out here and here. The deeper you dig, the dirtier it gets.. With all of these lawsuits flying around what does the President think it looks like when he meets the likes of Alfa-Group chief Mikhail Friedman, particularly as he met him when he should have been attending a Cabinet Meeting with Yanuk and other ministers? Maybe he is not bothered any more..